Are you struggling to handle a difficult web or graphic design client right now? Maybe you’re so frustrated you want to end the project. You want to fire your bad client and wash your hands of their picky demands. It was 6pm on a Wednesday night. I had gone to watch the new Rush Hour movie with a few friends. As we came out of the cinema, I looked at my phone and saw an email from my client. As soon as I spotted the first two sentences, written in ALL CAPS, I knew I was in trouble. I was designing a Wordpress website for her but since my web design process was a hot mess, the project was a train-wreck and she was disgusted by my lack of professionalism. Back then, I didn't use a project management tool so we sent 77 back and forth emails across dozens of threads. It was a confusing mess! We used a pre-made theme for her website and I forgot to tell her of the limits of that theme. So when she asked for "one more feature..." my answer was always "I can't do that" and she was always disappointed. I only told her how many revisions she was allowed once (at the very started of the project), so she asked for endless revisions and got annoyed when I stopped at two. It was MY fault, not hers. It was my fault that she felt disappointed and angry, asked for endless revisions and didn't respect my work hours. Because I had not set boundaries and expectations with her upfront. I wasn't organized. I wasn't professional. But the truth is, I'm grateful for that client! She made me realize I couldn't keep offering my services and charging my clients thousands of dollars if I didn't give them an epic experience. That would make me a nightmare freelancer. The kind that clients tell horror stories about at dinner parties, and I didn't ever want to be that. 01. Did I outline my boundaries and set client expectations upfront and continually throughout the process? Boundaries = Your work hours. How you’ll communicate. How Skype/Zoom consultations are scheduled and how far in advance. Setting Client Expectations = telling the client how long it will take you to reply to their messages etc. It’s not enough to state this kind of information upfront once. You need to find places throughout the process to continually remind your client of this. One place is inside your contract (if you don’t have one, here’s a link to a great template), and inside your project management tool if you use one. 02. Before firing a client, ask yourself, was the process I took them through as organized as it should be? 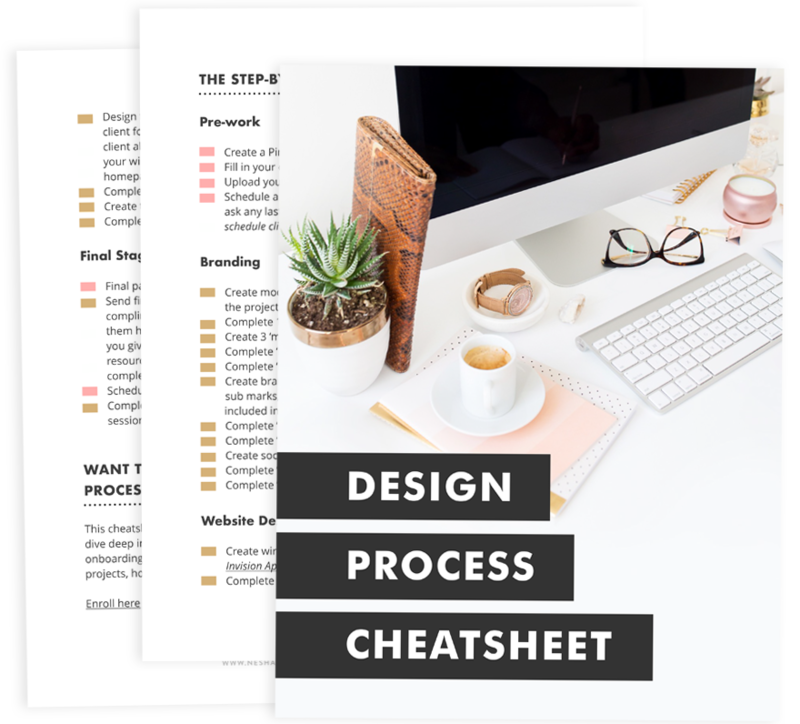 If your design process is unorganized and chaotic with no real structure, your client is going to be confused. YOU are going to be all over the place, asking them for information you should have asked for before the project began or delaying the deadline because you underestimated how long it would take. You’re going seem like an amateur. And when you do, your client has a right to feel annoyed. Your unorganized design process may have caused the client to turn into a nightmare. You have to own up to that & do something to stop it from happening in the future. If you need help, I have a free course that will help you! It’s called Project Management For Designers. Join below!